Congress General Secretary Priyanka Gandhi Vadra on Thursday triggered speculation that she might contest against Prime Minister Narendra Modi from the Varanasi Lok Sabha seat. Congress leaders, however, said they were uncertain if she really meant it or the remark was a joke. Varanasi goes to polls in the last phase of the elections on May 19, and the Election Commission is yet to notify the dates for filing of nominations. With nearly two weeks to go before the notification for the last phase, the Congress hopes it will get enough time to gauge the public mood and take a decision, but the remark could help enthuse party workers in Uttar Pradesh. 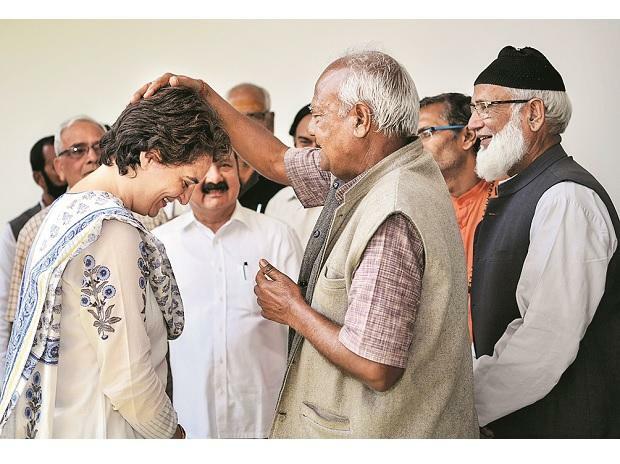 Priyanka sprang this surprise on Thursday when she told party workers in Rae Bareli (the constituency represented by Sonia Gandhi, her mother and former Congress president) that she could contest from the Varanasi Lok Sabha constituency. The Bharatiya Janata Party (BJP) has already announced that the PM will recontest from the seat. In 2014, Modi had contested from two seats — Varanasi and Vadodara. He had won from both seats but later quit from Vadodara. The BJP is yet to announce a second seat for the PM. When Priyanka was appointed general secretary of the party, in-charge of Uttar Pradesh east’s 40 Lok Sabha seats, some in the party had expected her to contest from Rae Bareli as Sonia Gandhi had earlier hinted at retiring from electoral politics. However, the Congress felt the need to maximise its wins from UP, and has already announced Sonia Gandhi’s candidature from Rae Bareli, her sitting seat. Congress President Rahul Gandhi is contesting from Amethi, and there has been speculation that he could also contest from Kerala. Some in the party argued that she contesting from Varanasi would help galvanise party workers, and have the added advantage of pinning Modi to Varanasi when the BJP has plans that he will undertake a whirlwind campaign across the country. However, other sources said Priyanka meant it as a joke. The BJP expects the Varanasi seat to be a cakewalk. In 2014, Modi had received 56.37 per cent of the total votes polled in the constituency. Aam Aadmi Party’s Arvind Kejriwal was the runner up with 20.3 per cent and Congress party’s Ajay Rai had secured 7.34 per cent. The Nehru-Gandhi family has ventured out of their Amethi and Rae Bareli seats in the past. Indira Gandhi contested from Chikmagalur in Karnataka in 1978 and Medak in present day Telangana, apart from Rae Bareli, in 1980, while Sonia Gandhi has contested in the past from Bellary.